Denise (Lorraine Bruce), Jamie (Matthew Lewis), Bob (Timothy Spall, Leanne (Joanna Page) and Stuart (Matthew McNulty). “THERE’S a lot of worries about at the moment. Writer Kay Mellor has something to say about that in BBC1 drama The Syndicate, which begins at 9pm tonight (Tuesday March 27). The five-part series focuses on a group of five workers at a small local supermarket which is about to be closed down. Money worries spark a drastic course of action for some. And then they win £18m in the Mercury Millions lottery, giving them more cash than they ever dreamed of. 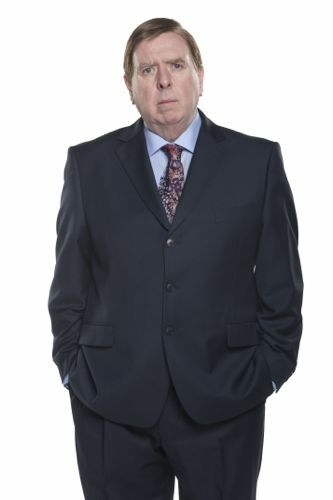 It’s a drama very much for our time, with a cast including Timothy Spall, Joanna Page, Lorraine Bruce, Matthew McNulty and Matthew Lewis. I’ve been a fan of Kay’s writing ever since Band of Gold. First interviewing her when I attended the launch for the very first series of Playing The Field in 1998. And, along with other members of the media, spoke to Kay again at a recent London post-screening question and answer session. What inspired you to write this series and what themes do you explore? Why did you choose that particular figure as the winning amount? Did you talk to anyone who’s had a life-changing win? What surprised you most about what they said? Did you hear from anyone who wished they hadn’t won? Why did she want to give it all away? What are the most common problems that people talked about? Should people that have committed crimes be eligible to win such huge amounts of money? Leanne (Joanna Page) and Denise (Lorraine Bruce). 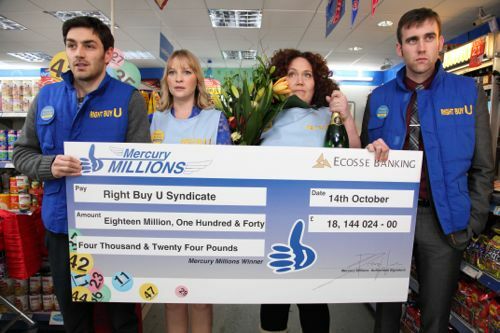 Did you discuss what you’d do – you and fellow cast members – with a Lottery win? What would you do if you did win £4m, say, on the Lottery? What would you buy for yourself? Matthew McNulty as Stuart and Amy Beth Hayes as Amy. What do you think about the current obsession with period dramas? It’s been a long time since Band of Gold, Fat Friends and Playing The Field? It’s as if we haven’t seen this kind of drama from you in particular for a decade? What’s your view of the Lottery? Do you think more people will buy Lottery tickets when they watch this? Bob (Timothy Spall) and Stuart (Matthew McNulty). Have you had any interaction with Camelot at all? Have they given you any feedback on what they think about the drama? But Camelot will be pleased? Have they been back in touch with you at all? The supermarket in the drama. A real supermarket? Lottery wins can bring out skeletons and people from the past? How do they try to encourage them to go public? People give up their jobs? 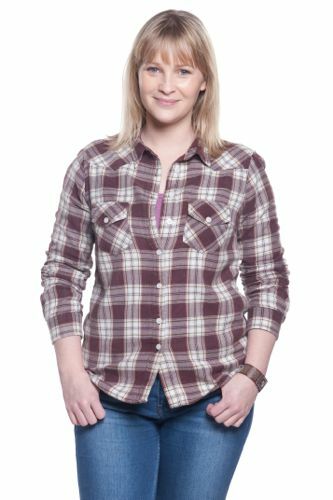 Posted in News and tagged Joanna Page, Kay Mellor, Lorraine Bruce, Matthew Lewis, Matthew McNulty, The Syndicate, Timothy Spall. Bookmark the permalink. This really is a wonderful and well written drama. The acting is so good and the characters have really come to life, I feel that I could have known all the winners. I have just watched episode 3 and what has really touched me is how they have handled Bob’s illness, it is very believeable and i loved the part where Annie asks Bob what is wrong with him and he replies he has a tumour he can´t say the name of, this is just so real. This is so well written and the acting is superb so real life,we are glued,and it is so touching it has brought tears to my eyes,please let there be more. I think it’s brilliant i’ve been telling everyone to watch it.. best thing the BBC has done in a while please do a second series your definitely onto a winner here.. think the storyline is fantastic! Fantastic drama. Second series needed please. Just wanted to say thanks to Kay Mellor, the BBC and all those involved in creating such a brilliant drama…me and my family loved it. Great story, great acting from EVERYONE involved…BBC please, please, please commission a second series. What an amazing drama. Well done Kay Mellor and the bbc. A second series is a must. I’d love to see a second series. Maybe more focus around the dogs home, or leanne and stuart could buy the supermarket and sack that horrible manager! but has she left some loose ends to make way for a second series. I do so very much hope so. Let us have more of the same please! I’ve just finished the last episode of this series and am sorry to see it end but glad to see so many loose ends…maybe another series in the offing? Brilliantly written, acted and portrayed! Good story lines, compelling viewing, outstanding acting by all the characters, excellent moral undertones – well done all. I am glad to hear we have another series in the offing. A bit sad not to get the happy ending one would have hoped for with the fIrst, but never the less how good it is that at last we are getting some enjoyable drama series from the BBC. It has been a long time coming. In my mind they’ve surely got to make a second season of the syndicate because you are left wondering what’s going to happen next with a couple of things that have happened. When I saw the syndicate advertised I was’nt expecting it to be my sort of program because that sort of program usually would’nt interest me the same as my mum did’nt think it would be her sort of program but we both decided to have a look at it to see what it was like. I was just curious being as it was a drama with a group of people winning the lottery and I thought it was brilliant and it had me and my mum both fixed to the tv because it was so good because it has a good story with it’s serious and sad parts in it but it also has some funny bits to and I also have the DVD preordered because I thought it was that good. Please make a second season of the syndicate and continue the story ! Darren – think you’ve missed my comment above about the announcement of a second series. Great series – I’ve been glued to it since episode 1. What I would like to know on a very practical level is if there is a knitting pattern for the hat worn by the little boy in the last episode. It was a woolly hat with a “headphones” pattern . Kay Mellor. Best of luck with lots of things like, winning an Award for your writing (and direction). And a second series? So much potential and half closure to create a second series. Coming from West Yorkshire (although I live abroad now) allowed me to recognise lots of traits and characteristics – well portrayed. Fantastic actors to boot. Bravo!! Loved this, hope there will be a second series! You can’t leave it like that! My 14 year old son watches very little t.v. And certainly none with his boring old mum but not only did he love and watch every episode, he asked me to watch it with him and it sparked off some good conversations. Evidence it was an excellent story. Thank you. Sat down today to watch the last episode that my wife and I both assumed would be shown. Shocked and a bit disappointed to realise last week’s was the last one. Why leave everything up in the air like that? Felt like a penultimate episode. I missed episode 5 – the last one – but I can’t find it on iplayer????? Patricia. I missed it too! It was repeated on iPlayer but only for 7 days. When I queried it , the reply was that the whole of Series 1 might be repeated, especially when Series 2 is broadcast…..too long to wait though. I have just watched the entire series and was spellbound. So well written and brilliantly acted and directed. Well done BBC yet again proof that my Licence Fee is worth every penny.